The celebrated composer is back from a recent health scare with his first solo album in eight years, and it's a dark, eerie, ethereal beauty. People react to the subject of mortality in different ways. It wouldn’t be surprising for a musical artist to release a sunny, life-affirming album after staring into the abyss with a deadly disease only to come out of it with a second chance. For Oscar- and Grammy-winning composer and pianist Ryuichi Sakamoto, his 2014 cancer diagnosis -- and subsequent recovery -- likely inspired a great deal of soul-searching, although what you find on his latest album, async, is a dark, sparse work that, while gorgeous, is a collection of very deliberate moves that are highly creative but not necessarily celebratory. 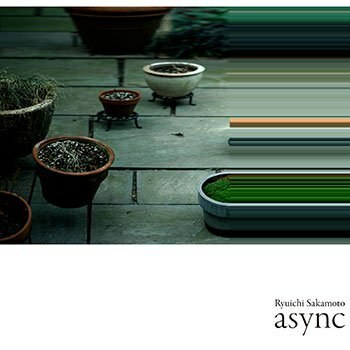 async is Sakamoto’s first solo album in eight years, without counting his 2015 score of Alejandro Inarritu’s The Revenant. Judging by the tone of this brilliant new album, Sakamoto is not intent on flooding his fans’ ears with a rushed barrage of multiple sonic ideas. This is a somewhat minimalist feast of keyboard beds mixed with field recordings and “found sounds” that are equally jarring and soothing. It would only be considered “new age” if your idea of new age is the revolutionary prepared piano pieces of John Cage, for example. During the creation of async, Sakamoto came upon the concept of creating a soundtrack for a nonexistent film by the late director Andrei Tarkovsky (Solaris, Andrei Rublev, Stalker), which is an odd way to approach a music project -- even someone like Sakamoto, who won an Oscar for his score of Bernardo Bertolucci’s The Last Emperor. But using the idea of a film score makes sense as the music creates a lush yet unsettling background ambiance. The stark, reflective piano that runs through the opening track, “andata", recalls the simple yet moving notes of Erik Satie but is eventually thrown into a darker hole with the addition of funereal organ chords and unusual white-noise effects. Soon we’re in the territory of the aforementioned John Cage with “disintegration", which combines sparse, industrial-sounding low, blunt piano notes, seemingly struck at random, while a pulse is eventually generated with instruments of a higher register and low, humming synthesizers. It’s the sound of a dark, subterranean beast slowly coming to life. This combination of old and new sounds is also present in songs like “ubi", where what sounds like a distorted sonar ping is paired up with plaintive solo piano. “ZURE” uses ‘80s-era minor-key synth chord blasts and combines them with noisy distortion that cuts in and out like a bad radio signal. “walker” is a dark, simple, quiet piece that fuses droning music beds with audio samples of what sounds like footsteps walking through a forest. Plenty of spoken word samples find their way into async as well, adding even more layers of sonic curiosities. “fullmoon” features the voice of author Paul Bowles (whose book, The Sheltering Sky, was made into a 1990 film scored by Sakamoto) speaking on the subject of death and how to come to terms with it. This is combined with a variety of male and female voices in all manner of foreign language, creating an eerie collage of music and dialogue that is both ethereally beautiful and deeply mysterious. Tracks like “ff” create much simpler landscapes, with long, sustaining synthesizer chords gently overlapping in a manner strongly reminiscent of Brian Eno. The closing track “garden” uses those same aural “long takes", with simple yet deeply meditative chords stretching across the composition, albeit with a slightly more grating and distorted sonic palette. It’s hard to say if the songs on async are a direct or indirect reflection of his recent health scares -- it’s tempting to overanalyze music created in the aftermath of such events -- or if this is simply a real soundtrack to an imaginary film. Whatever the case, Ryuichi Sakamoto is back and shows no signs of being boring or predictable. For this, we should all be thankful.